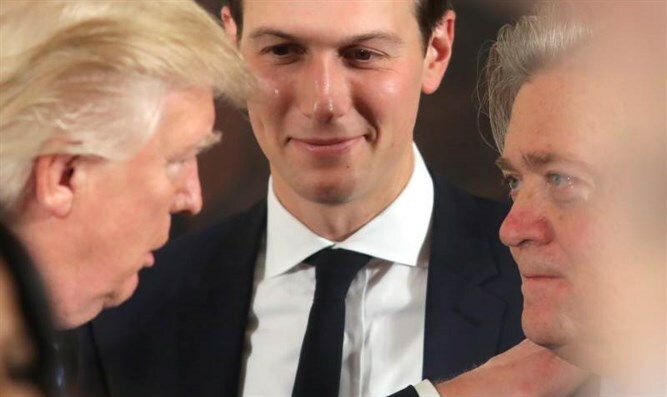 MainAll NewsUS & CanadaDid Bannon reveal plan to move US Embassy to Jerusalem? Did Bannon reveal plan to move US Embassy to Jerusalem? Is the US planning to move embassy to Jerusalem? Photo of Trump strategist may have accidentally leaked White House agenda. Did one of President Trump’s closest advisors inadvertently leak White House plans to relocate the US Embassy in Israel from Tel Aviv to Jerusalem? Candidate Trump pledged that if elected he would implement a 1995 law requiring the transfer of the US Embassy in Israel from Tel Aviv to Jerusalem, and the formal recognition of that city as Israel’s united capital. As president, however, Trump has remained mum on the issue, giving little indication whether he plans to make good on his campaign promise. President Trump hinted a decision may be close at hand, however, telling reporters last week they should ask him about the possible move again in a month – corresponding roughly to the planned trip by the president to Israel to meet with Prime Minister Binyamin Netanyahu. While no official confirmation on the trip has been given, officials close to the Prime Minister say the president is expected just ahead of Jerusalem Day, which begins the evening of May 23rd. Though President Trump’s intentions vis-à-vis the embassy move have remained a mystery, an innocuous photograph taken by Rabbi Shmuel “Shmuley” Boteach during a visit with White House Chief Strategist Steve Bannon may have let the cat out of the bag. The joint selfie, taken during a visit in Bannon’s office on Israeli Independence Day, shows the former Breitbart News chief in front of a white board featuring a list of campaign promises, some with check marks, others without. On the list, in the lower right-hand corner of the picture, the words “Tel Aviv to Jerusalem” can be seen, likely referring to the planned embassy move.